Kosher salt --- 2 tsp. Garlic cloves, minced --- 6 ea. Italian parsley, chopped --- 4 Tbsp. Rinse chickpeas, then place in a bowl; add enough cold water to the bowl to cover chickpeas by 4 inches. In a separate bowl, do the same with the cannellini beans. Soak both beans for 24 hours. Drain and rinse chickpeas; place in a large saucepan with 7 cups of cold water. Add carrot, celery, onion, cherry tomatoes and 4 tablespoons olive oil. Bring to a boil, then partially cover and adjust heat to simmer for 1 hour. Stir occasionally. Add cannellini to simmering mixture. There should be at least an inch of liquid covering the beans; add more water if necessary. Return to a boil then partially cover and adjust heat to simmer for 45 minutes, stirring occasionally. In a sieve, rinse the farro; stir farro into beans along with salt. There should be about 1/2 inch of liquid covering the beans and grain; add more water if necessary. Return to a boil, then partially cover and simmer 30 minutes, or until beans and farro are tender. When done, most of the surface water should have been absorbed or evaporated, but the stew should be slightly soupy. 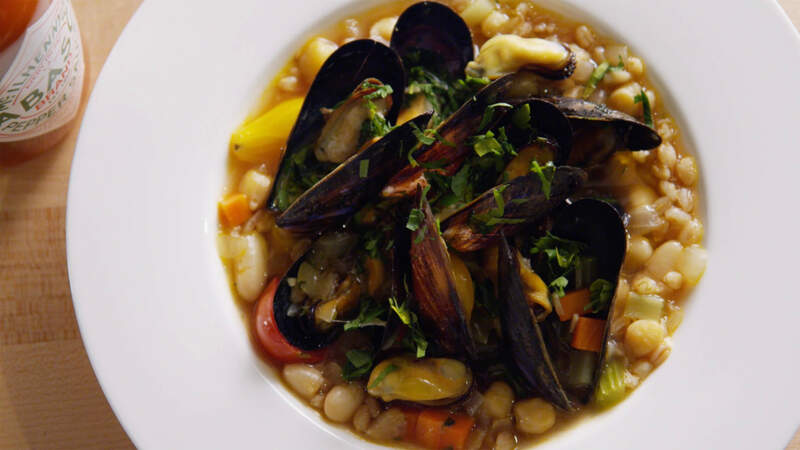 While farro is simmering, prepare the mussels. Into a sauté pan, pour the remaining 4 Tbsp. olive oil, then scatter in the garlic cloves. Over medium-high heat, cook 3 minutes or so until garlic is lightly colored, then add all rinsed mussels at once. Tumble them around the pan quickly to coat with oil, and cover. Turn heat up to high and cook for about 2 minutes, shaking the covered pan a couple of times, just until the mussels open, then remove pan from heat.